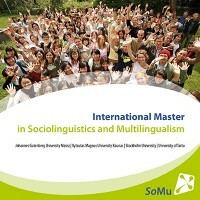 SoMu is the acronym of the International Master’s Programme in Sociolinguistics and Multilingualism. It is a new joint two-year degree programme offered by Vytautas Magnus University, Kaunas (Lithuania) and Johannes Gutenberg University, Mainz (Germany) in cooperation with the University of Stockholm (Sweden) and the University of Tartu (Estonia). This new Master’s Programme offers in-depth knowledge to students who are interested in the role of language in society. SoMu starts in the winter semester. It is admission free, taught in English and provides students with an international degree. Throughout the last decade, multilingualism has become a key factor internationally. Public interest in multilingualism and how to deal with it is growing steadily and provides a great opportunity for societal change. Increasing immigration and globalization demand more sensitivity concerning mutual understanding, tolerance, mobility, flexibility and social structures. SoMu has apprehended these developments and social effects and made them the focus of the Master’s Programme. The interaction of different languages and cultures in everyday encounters and social areas is firmly established, be it in commerce, migration or tourism. Multilingualism is not a new phenomenon. Today’s developments are situated between long-known and new phenomena, between straightforwardness and complexity, between the individual and society. The International Master’s Programme gives students insight into European multilingualism in the Baltic Sea Region; they will not only learn about but also experience multilingual situations. Students will obtain practical tools to analyze multilingualism while gaining interdisciplinary competence. They will familiarize themselves with the general theories and methods of sociolinguistics such as traditional sociolinguistics, constructivist sociolinguistics, language variation and many other approaches. In addition, students will broaden their international experience in at least two semesters abroad, acquire language skills in the less common European languages of Lithuanian, Estonian and/or Swedish and deepen their command of English. A broad approach to multilingualism extends SoMu beyond language policy and planning issues concerning just one European minority population or country. Students acquire competences in two international vehicular languages as well as in at least two less commonly spoken and taught languages. Attention is paid to advancing students’ interdisciplinary skills in use-based linguistic theories beyond sociolinguistics, as well as in the cultural and political sciences and constructivist theories of sociology. The programme covers the entire Nordic and Baltic Sea region. No other linguistic MA programme covers such a wide range of languages spoken around the Baltic Sea. The language courses and student mobility offer a rich live context for deepening cross-cultural awareness and developing cross-cultural communication skills; the programme’s academic contents support the learning of cultural sensitivity and new patterns of communication. Studying abroad is compulsory and equally long study periods in three universities in three different countries are required. Students accumulate international experiences, attain language skills in the less common European languages of Lithuanian, Estonian and/or Swedish and strengthen their command of English. Critical thinking and practical research skills are emphasized and systematically supported by developing student competence in academic communication in the programme’s languages, as well as in the co-operation, dissemination and management of (student) research projects. Graduates will be able to identify and formulate sociolinguistic research problems, plan and organise individual research-based contributions to sociolinguistic knowledge bearing on a significant problem concerned with multilingualism in Baltic Sea Europe, conduct empirical research projects, deal with existing research knowledge, and gain interdisciplinary methodological skills. SoMu trains a new generation of sociolinguists who will possess a broad scholarly and practical understanding of the parallel use of multiple languages in Europe and a professional awareness of multilingualism’s social dynamics and its cultural, political and socioeconomic impact in varying European contexts. Applications are handled by Vytautas Magnus University in Kaunas. Studies in this two-year MA programme begin every year in the autumn semester. The application form and the deadline for applying are available online at http://somu.vdu.lt The entry qualification is a Bachelor Degree or equivalent in the Humanities or Social Sciences. The Bachelor Degree shall contain at least 30 ECTS in the field of linguistics or philology. Application documents are accepted in English, German and Lithuanian. Often you can get an appropriate transcript from your university. If this is not the case, you will need official translations along with verified copies of the original. Good knowledge of English at the B2 level of the Common European Framework of Reference for Languages is required. Students from non-partner universities may be asked to provide proof of English language proficiency. The following certificates in English will be accepted: Cambridge First Certificate in English, telc English B2, LCCI Level 2, TOEFL iBT 87 points or IELTS Grade 5-6.University records may have to be authenticated by apostille or certified by the Centre for Quality Assessment in Higher Education in Lithuania www.skvc.lt in special cases.